Fun Fake News: TSA’s Giant Blue Latex Glove Balloon Gropes Macy’s Thanksgiving Day Parade! The TSA says: "Hello Kitty"?! What can only be described as sheer terror broke out among the thousand of spectators lining the Macy’s Thanksgiving Day Parade route today as they witnessed this year’s Transportation Security Administration (TSA) entry – A Giant Blue Latex Glove -- turn the corner onto 34th Street, floating above their heads, slowly headed their way. People scattered about the parade route, dodging into buildings and climbing lamp posts attempting to hitch a ride onto the backs of one of the other giant balloons, hoping to escape the giant TSA blue latex glove, though it was to no avail. Eventually it caught up to them…in the end, frisking and groping them for contraband and weapons of mass distraction of any kind. TSA’s two-story tall inflatable gloved entry was one of 15 giant balloons and 43 novelty balloons participating in this year’s Macy’s Thanksgiving Day Parade, said parade planning officials. 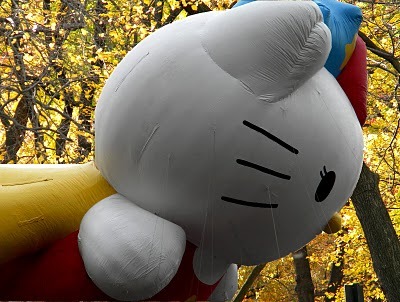 According to witnesses, the giant blue latex glove first went out of control when the wind changed direction causing the giant “Hello Kitty” balloon to brush up against it. Sparks were reportedly seen by parade goers when the TSA balloon came into contact with “Hello Kitty” balloon, causing concern for a real chance of electrical shock. “The amount of static electricity generated from the friction of those giant balloons could have taken out half the crowd,” later said a concerned parade official. Fortunately, the clap…of thunder that the static electricity produced pushed the balloons apart, resulting in a micro storm front. That took the form of a little black cloud that hovered over the giant TSA blue latex glove for the rest of the parade. Terrified witnesses watched helplessly as the TSA’s floating terror and accompanying black cloud headed for two giant hovering pumpkin balloons further down the parade route. After the incident, hundreds attempted to file a police report, alleging they all felt violated by the experience. However, they were turned away. Told it was a civil matter and handed a bottle of K-Y Jelly instead. “There’s not enough water-base, water-soluble personal lubricant in the world,” said a traumatized parade spectator, laying alongside the parade route in the fetal position. To everybody’s relief, the giant rogue TSA glove was finally halted when handlers of the “Tom Turkey” novelty balloon got an idea. Apparently, when the TSA glove got wind the ‘Tom Turkey’ novelty balloon it just could not resist and headed straight for it, dragging along its handlers behind it. With all five fingers squeezed together, forming a cone like missile tip, it rammed its way all the way up the posterior of ‘Tom Turkey’, trapping itself there. Copyright © 2010 by Robert W. Armijo. All Rights Reserved.